The Garrya elliptica or Silk Tassel Bush is a native of California and Oregon and is best known for its long, catkin-like tassels seen in winter and spring. The name Garrya was given by David Douglas after a Nicholas Garry, secretary of the Hudson’s Bay Company, elliptica, after the shape of the leaves. It provides an evergreen and floral interest through the winter months. At other times, its grey green foliage passes unnoticed when other trees are showier. The male plants have more impressive, longer tassels. The female plants have shorter tassels developing into clusters of round, deep purple fruit. Another attractive feature is the leaves, shiny on top with a soft woolly underside. It can tolerate salt-laden winds and industrial pollution, making it ideal for coast and cities. The most popular variety is ‘James Roof’, with its 20-30cm tassels lasting many weeks. 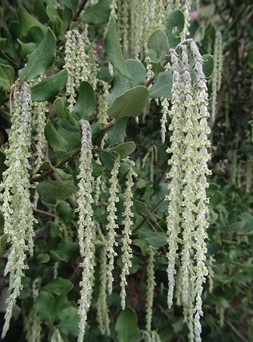 Garrya elliptica is from dry, upland regions and does better in open, sandy soils rather than heavy clays. It is also tolerant to drought and grows well in sun and some shade. It grows to 4m or larger but can be controlled by pruning without any ill-effects. Garrya can be easily trained and can be espaliered against a wall, making it useful for smaller gardens. The tree does not care to be transplanted, so plant it in its final position and expect is to be there for some time. It is easily propagated from semi-hardwood cuttings and by layering to ensure it remains true to type, although it can be grown from seed.